To make the marmalade, bring vinegar to a boil. Mix in tamarind paste. Bring to low heat to keep warm. In a hot skillet, add vegetable oil and diced onions, stirring occasionally until onions are caramelized. Stir tamarind paste and vinegar mixture, strain. Add the strained liquid, sugar and thyme to caramelized onions. Cook the marmalade on medium heat until most of the liquid has evaporated and onions appear translucent. Season with salt and pepper. Toss the broccolini in olive oil and season with salt. 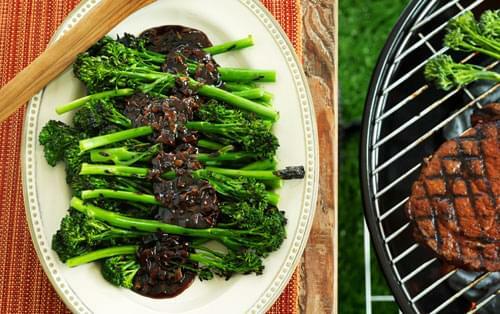 Place broccolini on grill and grill until soft and cooked through. Plate your broccolini and top with the warm marmalade. Credit: Recipe created by Chef Gregory True of Red Fish Grill in Miami on behalf of the Walmart Choice Steak Challenge presented by Kingsford® charcoal and Coca-Cola®.